Coming from Australia and being a wine drinker has its perks but also its disadvantages. As a wine-producing country we make more than enough wine to consumer ourselves. In actual fact, we produce so much that more Australian wine is exported than consumed within the country. Most of the wine is fairly basic approachable wine, a lot of which gets exported and has subsequently led to Australian wine being assumed to be all the same. This is of course not the case, as Australia is an extremely large country with a very wide variety of climates and regions. Thus Australia is quite possibly the most diverse producer of wine in the world, and Australian consumers now have access to an endless number of varieties and styles from over 100 regions. Like many other New World wine producers the vast majority of the wine is made from varieties of French origin, but unlike others we now grow a range of Italian, Spanish, Portuguese and even more obscure Eastern European varieties. Because of the accessibility and quality of the wines produced locally, Australia is not a large importer of wine, apart for that from New Zealand. The wines we do import are generally those we can’t produce ourselves, and are of a much higher quality. Thus in the past most of the wine was from the best regions in France, some from Italy and Germany, and less from Spain and Portugal. This has meant that many varieties and regions from around Europe are largely unheard of in Australia that may be better known elsewhere. This leads me to my point that it was necessary for me to actually come to the regions that are unfamiliar, to learn about these varieties and styles, because as the quality of wine improves new wines will become more available around the world. The Marche region is another Italian region with a long history that is relatively unknown outside of the region. Located in central Italy on the Adriatic Coast, the major city of Ancona is one of the most important ports for the country, being the aquatic gateway to Croatia and Greece. The region thus has a fairly Mediterranean climate, but most of the region is quite mountainous and the valleys that rest along the coast draw cool air in. Thus the region is ideal for producing both white wines and red wines. 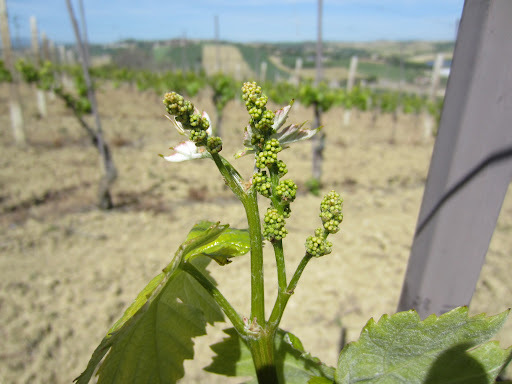 The most important and prominent white grape variety is verdicchio, with two DOC areas dedicated to verdicchio wines. For red wines the little known lacrima variety is king in certain parts, but the montepulciano and sangiovese varieties are very common as are ‘international’ varieties such as merlot, cabernet sauvignon and syrah. 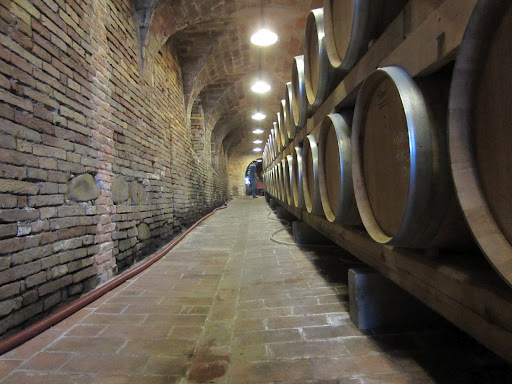 One of the most important wineries in the northern part of the Marche wine growing area is Santa Barbara, which was founded back in the swinging sixties. The village of Barbara where the winery is located is one of the historic castles of the Castello dei Jesi, which is also the DOC for the most important variety in this area; verdicchio. The Antonucci family were bakers by trade before the opportunity arose to purchase vineyards and establish a winery in an area with a rich viticultural history. Stefano Antonucci took over the running of the company in the late ‘80s after a career in finance, and radically changed the landscape not only for the Santa Barbara winery but for Marche wines in general. 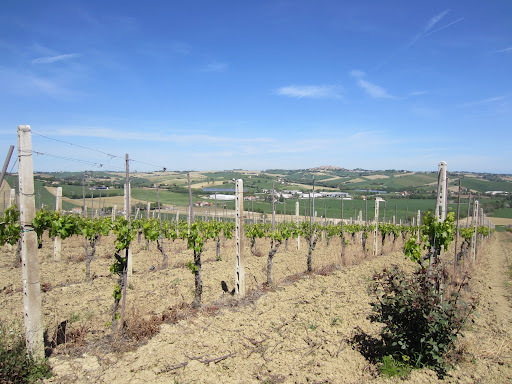 As he began to purchase new vineyards and significantly improve the quality of the wines, he began to take the verdicchio variety to the world with great success. The wines of course were fantastic, but in the competitive market developing in the ‘90s this was not always enough. He achieved great success through PR launch events, often surrounding himself with very photogenic people in an effort to secure media attention. The winery today produces around 700,000 bottles, making it a medium-sized winery, and the fruit comes from three areas within Marche. The focus is on white wine, as Santa Barbara is one of the most prominent producers of verdicchio dei castelli Jesi, with penetration in many markets. Working at Santa Barbara is like working for a large family, as described by Roberto who is the jack-of-all-trades at the winery, and hosted me through the vineyards, cellars and a tasting with some spectacular salami and cheeses. Click here to read my tasting notes. 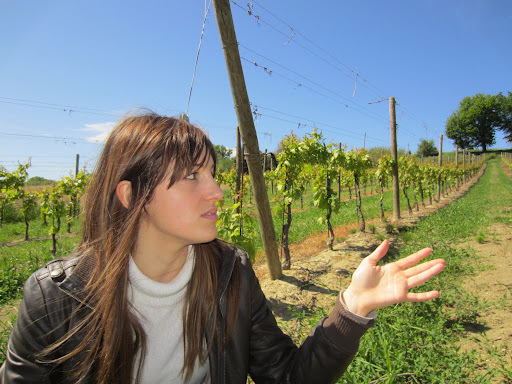 A much smaller winery which is not at the mercy of the markets is Vicari, located in the home of the lacrima variety – Morro d’Alba. The Vicari family have been producing wine in the village since the 1600s, and were recently acknowledged by the municipality as one of the historic families in the region. Back in the 1960s the family was barely producing 200 bottles, purely for private consumption. Back in the 1980s however the family decided to begin making wine commercially, and in the space of just over 20 years, they have grown 500-fold to now produce a modest 100,000 bottles. 19 hectares of vineyards are planted on mostly south-facing slopes in a relatively small area. The winery produces both red and white wines exclusively from indigenous Marche varieties, with white wine being made from verdicchio. The most important red variety for the area is lacrima, a variety only found here. Three table red wines are made from this variety, with another incorporating a small amount in the blend, and a sweet passito wine as well. Lacrima means tear, and it is this characteristic that gives the variety its name, as the thin skin often causes the grape to weep when ripe. Vicari is a purely family run operation, with father and son running the operations and daughter Valentina handling the commercial side of the business. The wines are made with passion, commitment, humility and a great connection to their origin. Click here to read my tasting notes. Click here to see more photos from Day One in Le Marche, Italy.